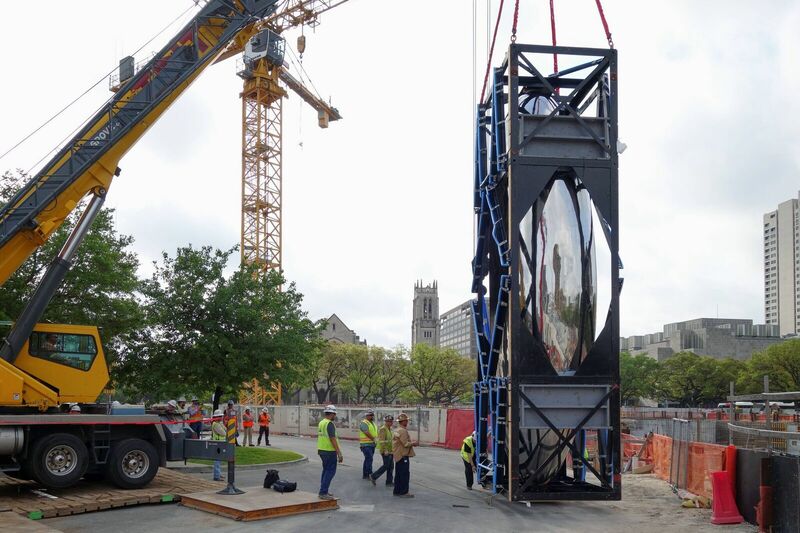 On Tuesday, the Museum of Fine Arts, Houston (MFAH) installed a sculpture by Anish Kapoor, the same artist behind Chicago’s Cloud Gate (better known as the Bean). The two sculptures are remarkably similar: both are hewn in shiny stainless steel and occupy prominent public spaces in their respective cities. They even have similar names and public sitings: Cloud Gate frames Millennium Park horizontally, while Houston’s Cloud Column is mounted vertically in front of the Glassell School of Art. In light of the install, writers in both cities took to the pages of their respective papers-of-record to defend their hometown sculptures and throw serious shade across the continent. Kapoor told the paper Cloud Column, which he imagined in 2000 and brought to life in 2006, is a totally separate thing from Cloud Gate, despite the obvious resemblance. Yeah, it’s true that we have a giant new shiny bean that stands upright. But Kim, did it occur to you that maybe we wanted it just because it’s a cool thing? It’s a piece of art, and works by the same artist often look similar. Our Calder looks kinda like other places’ Calders. It made me wonder: Is Chicago feeling defensive? How bad is it there, knowing that Houston is set to pass you in population, taking your spot as third-largest city in the U.S.? Are you feeling—well, to steal someone’s joke from Twitter–like a “has-bean”?